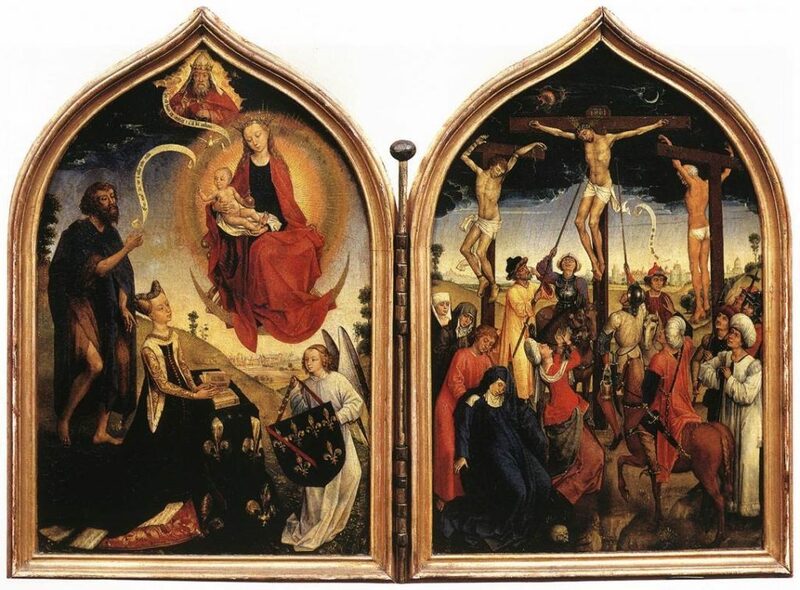 In the Middle Ages, devotional paintings rendered on two hinged wooden panels—known as diptychs—were used to depict religious scenes for meditation and contemplation. Portraits of Madonna and Child were common, as well as important biblical stories, like the Virgin birth or Christ’s betrayal and crucifixion. Many diptychs were created on a small scale so they could be portable, easy to store and convenient to prop open on a table for viewing, reflection, and prayer. As we observe the diptych in art, our minds grasp for the link, search to discover a connection. Compare, contrast. My interest in the diptych developed as a lover, writer, and teacher of creative nonfiction’s genre-bending forms. I searched for examples of the diptych structure in literature, which led me first to poets: Susan Terris, Jim Moore, and Robert Gray. Then I discovered the work of CNF writer Katharine Haake. I fell for her essay “Diptych: Chrysalis, Prayer” and noted some interesting commonalities with medieval and Renaissance diptych paintings. In her parallel essay, Haake offers two stories, juxtaposed, depicting key moments in her life, at different points in time with her two sons. She adopts the reflective voice, at times meandering out of scene for a moment to contemplate its meaning, and “perhapsing” at times. The two panels that make up the piece are, in fact, meditations on change and loss. When I read Haake’s work it struck me that, like the devotional two-fold paintings the literary form is modelled after, the diptych is an ideal form for wondering. For the experience of wonder, itself. Search for “diptych essay” or “parallel essay” and Google offers few examples. “Diptych narrative” will bring up a reasonable share of photographic results. In modern times, it seems, photography is the most common medium used for the two-panel form. I gave myself permission to draft in a more wandering, thoughtful way than I normally would for flash-length work. I typically use present tense, linking scene to scene by segmentation rather than exposition (to “show” rather than “tell”). First I wrote about a religious object: the gory cross I inherited when my grandmother died. I allowed one memory to lead to the next, letting the reader in on what I was thinking at the time. The piece that emerged surprised me. I wasn’t expecting to write about vivid memories I hadn’t considered as memoir material. It was a revelation, too, that allowing one moment to unspool after the next led me to something I had wanted to write about but was never sure how: the fact that my 94-year-old grandmother’s final wish was to be buried in a wedding dress. With the first panel done, I excitedly wrote a second panel, this time choosing as an object of focus a pewter praying girl that had hung on my childhood bedroom wall. I formatted the two stories side-by-side on the page using a table in Word. Then I emailed my first diptych essay to a friend. She observed that the two pieces had something in common beyond the obvious: the shared defiance and optimism of grandmother and granddaughter, who each in their way rejected the emotional weight carried by religious objects. I hadn’t seen that, but my friend’s observation helped me come up with the title for my diptych: Iconoclasts. I loved the diptych as a form, but also adored it as a tool for contemplation and discovery. I loved that writing loosely, without an agenda—road tripping without a map—helped me unlock the door to memories I may not have otherwise written about. And that this form seemed to hold up without a strong narrative arc for juxtaposed meditations. That even in flash, there could be room for rumination. I sent my writer friends guidelines, framing the diptych as a unique sub-form of flash in which rumination was a key characteristic. I suggested that writers approach the form either meditatively or thematically. The writer of a meditative diptych contemplates memories and associations linked to objects of focus. In the process of reflection, the narrative unspools. I suggested anything that invites contemplation could be an object of focus: natural beauty, sentimental items, loved ones, a song, a work of art. Meditative or thematic, the writer of the diptych essay first focuses on something outside themselves in order to see, and then, through meditation and writing, may begin to see more. “I’m writing about things I never imagined,” one writer told me after drafting her first diptych essay. “I’m seeing a way to upcycle a bunch of writing I didn’t know what to do with,” said another. Shot 1: A photo of a church wedding—a broad pan of the bride, groom, and attendants facing the altar from the pews. Shot 2: An up-close image of the bride’s funky, bejewelled, multi-color shoes. I suggested that the diptych essay could bring together two autobiographical prose poems, micro-essays, or flash vignettes. Rowan McCandless’ “Mirror Image” conveys the unease of a subject that’s been treated like an object—made more uneasy when what is projected is mistaken for an accurate reflection. With the diptych, the enchanted mirror may be an apt metaphor. The two stories, juxtaposed, are an imperfect likeness—but there is an echo that reverberates across panels, tying them together. I think perhaps it’s the distribution of weight—the similarities and differences in two side-by-side stories—that give the diptych its power. The same way we look at fraternal twins, then look again. 1. Brainstorm a list of pairs—objects, memories, images—that may make for an interesting juxtaposition. Is there a theme you could develop in the piece that connects the two? 2. Collect some images—photographs, magazine pictures, other ephemera—and do a free write on each artifact. How might two fragments come together as a diptych poem or essay? 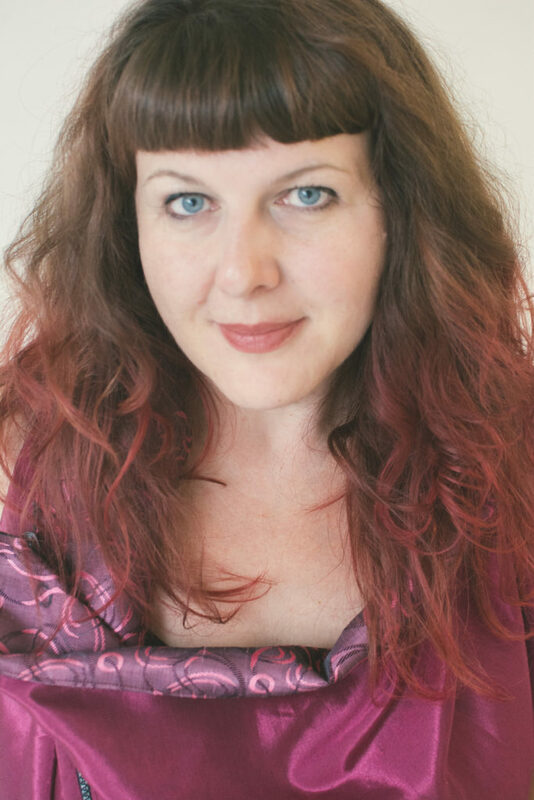 Nicole Breit is a poet, essayist, writing instructor, and the creator of Spark Your Story—an online writing program for brave truth tellers who want to get playful with form. Nicole’s work has appeared in Hippocampus, Room, carte blanche, Event, Archer, After the Art, and The Puritan. Her award winning lyric essay, “An Atmospheric Pressure,” was selected as a Notable in Best American Essays 2017. She lives on British Columbia’s gorgeous Sunshine Coast. It is an interesting approach, an ekphrastic challenge. Thank you. Thank you for reading and your comment, Jan! Another thought-provoking call to explore wonder and form in our CNF. Thanks for this, Nicole Breit! Wonderful craft essay. Interesting, informative, and I’m inspired to try my hand at it. Thank you! Thanks so much for your kind words, Toby! This is one of my top 3 fave craft essays of all time–fresh, complex, and beautifully written. I went down a rabbit hole following links and then links to other links where I found lovely visual art, book lists, and additional craft essays. Enormous thanks for guiding me on this delightful and informative path. So much to love here. As a high school English teacher with a creative writing class, this was a wonderfully inspiring post. I agree with Anne McGrath’s comment: this took me on a journey to so many resources. I’m definitely going to try this form myself and with my students and will be sharing it with my colleagues as well. Thank you! Lovely! Thank you, Sara, for letting me know. Exploring this form has changed so much about what I thought a flash essay could be, and has helped my students approach their memories, and their writing, differently, with brilliant results. I hope your students enjoy it, too! I love this idea! I’m trying it out tomorrow. I do a fair amount of flash, but the idea of of juxtaposition is great. It could also make a good visual piece to hang. This is lovely to hear, Linda, and I can imagine a hybrid visual-textual diptych that could be hung on a wall. Great idea! Hi, and thank for your lovely comment! In Word you can create a table with two columns and one row to line up your text side by side. I’m not sure about Google Docs…I hope that helps! I’m bookmarking this essay. I struggle with writing nonfiction even though I really, really want to. My memory is porous, too many holes that lead me to write fiction, otherwise I’d be lying. I’m thinking of the diptych as one way to “fill” the holes in my memory, if only for my own edification. Interestingly, I did recently revise a couple of short stories that could be formed into a diptych: in one, a wife is ruminating on her life with a mentally ill husband while raising their two daughters; in the other, one of the daughters is coming to grips with her own feelings about her mentally ill father. It’s a stretch. But thank you for this wonderful essay. Like other readers who commented her, I’ll be doing down a few rabbit holes with the links you’ve shared, and it will be fun. Memory gaps, the slipperiness of memory, and the inevitable differing POVs of others present during an event are something we nonfiction writers have to wrangle with, but doing so while honouring the contract of truth with our readers can be an interesting creative challenge. Sounds like a great idea to bring together two short stories as a diptych! Katharine Haake, whose CNF diptych I mention, works in this format with short fiction, as well. I hope you enjoy the rabbit holes, Marie, and thanks for reading! I hadn’t heard of the diptych form before. Believe it or not, I learned of it on Twitter, with a link to this page! I have a few dozen essay ideas waiting to be developed. I’ll try this form and see what happens. Thanks for a wonderful post! That’s great, Debonis – glad to hear Twitter led you to my essay! Best of luck with your exploration of the diptych form. I’d love to hear how it goes! Excellent suggestions and great links and prompts. It reminded me of a prompt I’d been given in a workshop to write an object prose poem, creating two paragraphs about the object that were seemingly unrelated avenues toward the object, and then using the final sentence to link them. I suppose it became more of a triptych than a diptych. Thanks for your great sugestions! Thank you Kathy, and thanks for sharing the prompt from your workshop. It’s fun to see where creative challenges can lead. Happy writing!